Primary biliary cirrhosis is characterized by autoreactive T cells specific for the mitochondrial Ag PDC-E2163–176. We studied the ability of eight T cell clones (TCC) specific for PDC-E2163–176 to proliferate or become anergic in the presence of costimulation signals. TCC were stimulated with either human PDC-E2163–176, an Escherichia coli 2-oxoglutarate dehydrogenase mimic (OGDC-E234–47), or analogs with amino acid substitutions using HLA-matched allogeneic PBMC or mouse L-DR53 fibroblasts as APC. Based on their differential responses to these peptides (human PDC-E2163–176, E. coli OGDC-E234–47) in the different APC systems, TCC were classified as costimulation dependent or independent. Only costimulation-dependent TCC could become anergic. TCC with costimulation-dependent responses to OGDC-E2 become anergic to PDC-E2 when preincubated with mimic, even if costimulation is independent for PDC-E2163–176. Anergic TCC produced IL-10. One selected TCC could not become anergic after preincubation with PDC-E2163–176-pulsed L-DR53 but became anergic using L-DR53 pulsed with PDC-E2 peptide analogs with a substitution at a critical TCR binding site. 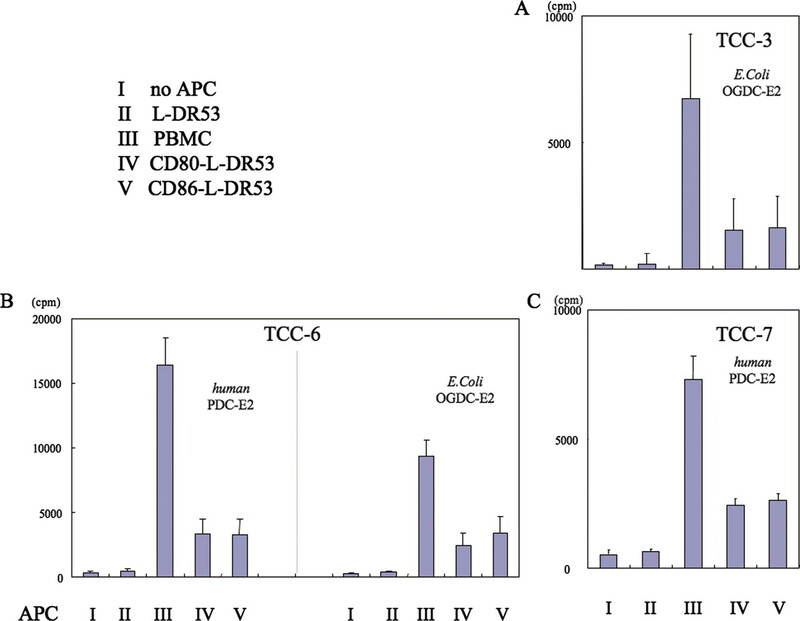 TCC that only respond to peptide-pulsed PBMC, but not L-DR53, proliferate with peptide-pulsed CD80/CD86-transfected L-DR53; however, anergy was not induced with peptide-pulsed L-DR53 transfected with only CD80 or CD86. These data highlight that costimulation plays a dominant role in maintaining peripheral tolerance to PBC-specific Ags. They further suggest that, under specific circumstances, molecular mimicry of an autoantigen may restore rather than break peripheral tolerance. Primary biliary cirrhosis (PBC) is an organ-specific, T cell-mediated autoimmune disease characterized by the presence of anti-mitochondrial Abs, inflammation and destruction of interlobular bile ducts (1). There is increasing evidence that the loss of tolerance to PDC-E2, the dominant mitochondrial autoantigen, and the bile duct injury produced by the multilineage antimitochondrial responses are central pathogenic events that are critical to understanding the immunopathology of PBC3. This evidence includes the observations that the frequency of autoreactive CD4 cells specific for PDC-E2 is increased in the liver and regional lymph nodes compared with peripheral blood of patients with PBC and that patients with more severe disease show an increased frequency of autoreactive CD8 cells specific for PDC-E2 (2, 3, 4, 5). The PDC-E2 is highly conserved and we have proposed that loss of tolerance can occur via several mechanisms, including both chemical xenobiotic modification of the autoantigen and molecular mimicry based upon cross-reactivity with Escherichia coli (6, 7, 8, 9, 10, 11, 12). The OGDC-E234–47 peptide of E. coli is the best putative mimic for PDC-E2163–176 peptide, the major CD4 epitope characterized in PBC (12, 13). Both PBC patients and healthy controls have PDC-E2-reactive T cells, indicating that silencing in the periphery rather than clonal deletion maintains tolerance in healthy subjects. One of the major mechanisms of peripheral tolerance is the induction of anergy. The activation of T cells requires at least two signals, an antigenic signal and a costimulatory signal, particularly via the B7 molecules CD80 or CD86 (14). Antigenic signal alone in the absence of costimulation can induce anergy (15). One approach to study the qualitative characteristics of T cell activation has been to modulate the TCR by either altering Ag concentration or using altered peptide ligands (16, 17, 18, 19). In addition, specific changes in costimulation may also affect the threshold level of T cell activation (20) and, in both human and animal models of autoimmunity, the costimulatory molecules CD80 and CD86 have been shown to play a critical role in breaking tolerance (21, 22, 23). We have previously shown that all PDC-E2-specific TCC from healthy controls could be induced to become anergic when stimulated with PDC-E2 in a system that lacked these costimulatory molecules, whereas some TCC from PBC patients failed to do so (15). Susceptibility to the induction of anergy correlated with the degree to which the response to PDC-E2163–176 was dependent on costimulation. Once anergy had been induced, these TCC exhibited regulatory function in an Ag-dependent fashion. Herein, we have addressed both the mimicry issue and the costimulation requirements in peripheral tolerance in more depth by studying the role of CD80 and CD86 in the differential responses of a panel of eight autoreactive TCC to human PDC-E2163–176 and its putative mimic E. coli OGDC-E236–47, both restricted by HLA-DR53. To dissect the role of costimulation molecules in the proliferative response and the susceptibility to the induction of anergy of these TCC, we used “complete” or costimulation-competent and “incomplete” or costimulation-incompetent Ag presentation systems, i.e., systems with or without the costimulation molecules CD80 and CD86. PBMC represent the complete system capable of presenting Ag and delivering costimulatory signals, whereas mouse fibroblasts transfected with HLA-DR53 (L-DR53), CD80-transfected L-DR53 (CD80-L-DR53), and CD86-transfected L-DR53 (CD86-L-DR53) constitute incomplete systems capable of presenting Ag while providing no or only partial costimulation. We report herein that TCC found in PBC exhibit distinct functional characteristics, and we suggest that these data are critical to understanding loss of peripheral tolerance. The development of eight TCC derived from PBMC of six patients with PBC has previously been described (15). In all cases, the diagnosis of PBC was based on international criteria and patients were positive for anti-microbial Abs and had previously undergone a liver biopsy (1). All patients were HLA-DRB4 0101 positive (4). The HLA-DR53-transfected mouse fibroblast cell line L-DR53 was a gift from Prof. Y. Nishimura (Kumamoto University, Kumamoto, Japan). L-DR53 transfected with CD80 or CD86 were prepared as described below. To transfect CD80 or CD86 into L-DR53 cells, we used lipofection of the BCMGShyg-hB70 expression vector (a plasmid constructed with expression vector BCMGShyg and human CD80 or CD86 cDNA) (24). After selection in medium containing hygromycin (Sigma-Aldrich) at 400 μg/ml, the cells were cloned by limiting dilution. Transfectants expressing CD80 or CD86 were monitored for stable expression over a period of 4 wk. Representative stable transfectants were selected for further work. Expression of CD80 or CD86 on these transduced L-DR53 cells (CD80-L-DR53 or CD86-L-DR53) was confirmed by flow cytometric analysis. Briefly, PBMC, L-DR53, CD80-L-DR53, or CD86-L-DR53 were stained by immunofluorescence using optimal dilutions of anti-HLA-DR, anti-CD80, or anti-CD86 Abs (BD Biosciences); the optimal dilution of each Ab was 10 μg/ml and stained cells were analyzed on a FACScan (BD Biosciences). Human PDC-E2163–176 (GDLLAEIETDKATI) peptide and E. coli OGDC-E234–47 (DEVLVEIETDKVVL) peptide were synthesized by F-moc chemistry using a peptide synthesizer (Model Synergy; Applied Biosystems) (4, 5, 13, 25) and purified by reverse-phase HPLC; the purity of all of the peptides used in this study was >90% as determined by HPLC analysis. In addition to human PDC-E2163–176, we prepared 19 different peptide analogs with a single amino acid substitution at position 168 (position E): 168D, 168K, 168R, 168F, 168W, 168Y, 168G, 168A, 168I, 168L, 168M, 168V, 168P, 168C, 168H, 168N, 168Q, 168S, and 168T. All peptides were studied at optimal concentrations of 10 μg/ml. TCC (5 × 104 cells) in 96-well round plates were stimulated for 72 h with human PDC-E2, E. coli OGDC-E2, or substituted peptide analogs of PDC-E2 using as APC either irradiated allogeneic HLA-matched PBMC (5 × 104 cells) or L-DR53, CD80-L-DR53, or CD86-L-DR53 (1 × 104 cells each) treated with 20 μg/ml mitomycin C. After the addition of 1 μCi/well of [3H]TdR during the final 12 h of incubation, cells were harvested and [3H]TdR incorporation was quantitated in a beta scintillation counter. TCC (5 × 106 cells) in 6-well plates were preincubated for 72 h with MMC-treated L-DR53 (5 × 105cells/well) that had been pulsed with human PDC-E2, E. coli OGDC-E2, or the substituted peptides 168K or 168W. In some assays, CD80-L-DR53 or CD86-L-DR53 was used in the same manner as L-DR53. TCC were then harvested, washed three times with PBS, and 5 × 104 cells/well of TCC were cocultured for 3 days with irradiated HLA-DR53-matched allogeneic PBMC (5 × 104/well) that had or had not been pulsed with human PDC-E2163–176 or E. coli OGDC- E234–47. Proliferation was assessed as described. TCC were preincubated with L-DR53 pulsed with human PDC-E2 or E. coli OGDC-E2 peptide. In some experiments, CD80- or CD86-transfected L-DR53 was also used for preincubation. Then, preincubated TCC (5 × 104 cells) were cocultured for 72 h with their corresponding non-pretreated TCC (5 × 104 cells) using irradiated HLA-DR53-matched allogeneic PBMC pulsed with PDC-E2 as APC (5 × 104 cells). Proliferation was determined as described. TCC (1 × 106 cells/well) in 24-well plates were incubated with irradiated HLA-DR53-matched allogeneic PBMC (1 × 106cells/well) in the presence or absence of human PDC-E2163–176 and supernatants were harvested after 24 h. For the assessment of the effect anergy induction had on cytokine production, TCC were preincubated with MMC-treated L-DR53 cells (1 × 105 cells/well) in 24-well plates as APC in the presence of human PDC-E2163–176, E. coli OGDC-E234–47, or 168K or 168W peptide for 3 days. They were then harvested, and viable TCC (1 × 106cells/well) were cocultured in 24-well plates with irradiated HLA-DR53-matched allogeneic PBMC (1 × 106cells/well) as APC in the presence or absence of human PDC-E2163–176. Supernatants were harvested after 24 h. Cytokine production was evaluated by a sandwich ELISA using a combination of unlabeled and biotin- or enzyme-coupled mAb to IFN-γ and IL-10 as described elsewhere (15). In all experiments, APC not pulsed with Ag were used as negative controls. Cell viability was assessed in all assays by trypan blue staining, and cell viability was consistently >90%. All experiments were performed in triplicate and mean results are presented graphically, with the error bars showing the SD. Due to the great variability in the magnitude of the responses, results are shown separately for each of the clones, but grouped according to the response pattern. Because the differences in the responses of the TCC were distinctive, statistical analyses were not performed. We previously established eight TCC from six patients with PBC who were HLA-DRB4 0101 following repeated stimulation of the human PDC-E2 peptide (15). The names and characteristics of these clones are shown in Fig. 1⇓. As noted in Fig. 1⇓, TCC-1, -2, -3, -4, -5, and -6 cross-reacted with E. coli OGDC-E234–47, whereas TCC-7 and -8 responded only to human PDC-E2163–176. HLA restriction of human PDC-E2163–176 and E. coli OGDC-E2 were HLA-DRB4 0101 (HLA-DR53) (data not shown). Proliferation assay of TCC to human PDC-E2163–176 (PDCpep) or E. coli OGDC-E234–47 (OGDCpep) using L-DR53 or PBMC as APC. When costimulation-incompetent peptide-pulsed L-DR53 are used, failure to proliferate indicates costimulation dependence, whereas a proliferative response indicates costimulation independence. Group A: the responses of TCC-1 and TCC-2 to both human PDC-E2 and E. coli OGDC-E2 peptide are costimulation independent; group B: TCC-3, TCC-4, and TCC-5 are costimulation independent to human PDC-E2 peptide and dependent to E. coli OGDC-E2 peptide; group C: recognition of both human PDC-E2 and E. coli OGDC-E2 peptide by TCC-6 is costimulation dependent; and group D: TCC-7 and TCC-8 respond to human PDC-E2 peptide in a costimulation-dependent manner and ignore E. coli OGDC-E2 peptide (1 ). The nomenclature of the clones in parentheses corresponds to their names in the original study that led to their development (15 ). In the original study that led to their development (15 ), TCC-1 were called TCC-independent 4 (1 ) from PBC1, TCC-2 were called s TCC-independent 5 (1 ) from PBC8, TCC-3 were called TCC-independent 1 (1 ) from PBC4, TCC-4 were called TCC-independent 2 (1 ) from PBC6, TCC-5 were called TCC-independent 3 (1 ) from PBC1, TCC-6 were called TCC-dependent 6 (1 ) from PBC8, TCC-7 were called TCC-dependent 7 (1 ) from PBC3, and TCC-8 were called TCC-dependent 8 (1 ) from PBC7. To assess the costimulation requirement of the eight TCC, we examined their ability to proliferate in response to human PDC-E2163–176 peptide and E. coli OGDC-E234–47 peptide using either a complete or an incomplete Ag presentation system (HLA-DR53-matched allogeneic PBMC or L-DR53, respectively). Four proliferative response patterns emerged (Fig. 1⇑). TCC-1 and TCC-2 proliferated in response to human PDC-E2 and E. coli OGDC-E2 regardless of whether PBMC or L-DR53 was used as APC. Hence, these TCC are costimulation independent when either human PDC-E2163–176 or E. coli OGDC-E234–47 are used as Ags. We designated TCC-1 and TCC-2 as group A. In contrast, TCC-3, -4, and -5 proliferated in response to human PDC-E2 presented by PBMC or L-DR53 and to E. coli OGDC-E2 presented by PBMC, but not to E. coli OGDC-E2 when L-DR53 were used as APC. Hence, these TCC are costimulation independent for human PDC-E2163–176 but dependent for E. coli OGDC-E234–47. TCC-3, TCC-4, and TCC-5 were classified as group B. TCC-6 showed a proliferative response to human PDC-E2 and E. coli OGDC-E2 when presented by PBMC but not when presented by L-DR53. Thus, TCC-6 is costimulation dependent for both human PDC-E2163–176 and E. coli OGDC-E234–47. TCC-6 is the only member of group C. Finally, TCC-7 and TCC-8 proliferated when cocultured with human PDC-E2-pulsed PBMC, but not with human PDC-E2-pulsed L-DR53, and did not respond to E. coli OGDC-E2 regardless of whether it was presented by PBMC or L-DR53. This indicates that TCC-7 and TCC-8 are costimulation dependent for human PDC-E2163–176 but ignorant of OGDC-E234–47. TCC-7 and TCC-8 were classified as group D.
We next examined whether presentation of human PDC-E2163–176 or E. coli OGDC-E234–47 by an incomplete Ag presentation system could render TCC anergic and whether susceptibility to anergy induction correlated with costimulation dependence. For this purpose, we preincubated the eight TCC with L-DR53 that had been pulsed with either of these peptides, then used irradiated allogeneic PBMC for a second round of stimulation. When preincubated with L-DR53 pulsed with human PDC-E2163–176 or E. coli OGDC-E234–47, TCC-1 and TCC-2 showed a strong proliferative response to human PDC-E2163–176 presented by allogeneic PBMC (Fig. 2⇓, group A). TCC-3, -4, and -5 preincubated with PDC-E2-pulsed L-DR53 also proliferated when cocultured with allogeneic PBMC pulsed PDC-E2. In contrast to TCC-1 and TCC-2, however, TCC-3, -4, and -5 preincubated with L-DR53 that had been pulsed with E. coli OGDC-E234–47 did not proliferate after subsequent restimulation with human PDC-E2163–176 (Fig. 2⇓, group B). Yet another pattern was shown by TCC-6. When this clone was preincubated with L-DR53 pulsed with human PDC-E2163–176 or E. coli OGDC-E234–47, it did not show any proliferative response to either peptide presented by allogeneic PBMC (Fig. 2⇓, group C). Finally, TCC-7 and TCC-8 preincubated with PDC-E2-pulsed L-DR53 did not proliferate when restimulated with PDC-E2-pulsed allogeneic PBMC. In contrast, preincubation of these two TCC with L-DR53 pulsed with E. coli OGDC-E234–47 did not prevent their proliferation after stimulation with human PDC-E2163–176 using allogeneic PBMC as APC (Fig. 2⇓, group D). These results indicate that TCC whose response to a specific peptide is dependent on costimulation become anergic when preincubated with L-DR53 pulsed with this Ag, whereas TCC whose response is costimulation independent do not become anergic under these conditions. The responses of all of these TCC are summarized in Table I⇓. Anergy induction by preincubation with human PDC-E2163–176 (PDCpep) or E. coli OGDC-E234–47 (OGDCpep) using L-DR53 as APC. Costimulation-dependent TCC become anergic when preincubated with L-DR53 pulsed with the corresponding Ag. Costimulation-independent TCC do not become anergic when preincubated with L-DR53 pulsed with the corresponding Ag. Group A: TCC-1 and -2 do not become anergic, i.e., proliferate with PDCpep-pulsed PBMC after preincubation with PDCpep or OGDCpep-pulsed L-DR53; group B: TCC-3, -4, and -5 proliferate with PDCpep-pulsed PBMC after preincubation with PDCpep-pulsed L-DR53, but not OGDCpep-pulsed L-DR53; group C: TCC-6 does not proliferate with PDCpep-pulsed PBMC after preincubation with PDCpep- or OGDCpep-pulsed L-DR53; and group D: TCC-7 and -8 proliferate with PDCpep-pulsed PBMC after preincubation with OGDCpep-pulsed L-DR53, but not PDCpep-pulsed L-DR53. We then examined whether the induction of anergy was associated with changes in the production of IL-10 and IFN-γ. For this purpose, we first stimulated the eight TCC with human PDC-E2163–176 using irradiated HLA-DR53-matched allogeneic PBMC as APC. All TCC produced significant amounts of IFN-γ and IL-10 under these conditions (Fig. 3⇓). We next used TCC that had been prestimulated with L-DR53 pulsed with human PDC-E2163–176 or E. coli OGDC-E234–47 and restimulated them with irradiated allogeneic PBMC that were or were not pulsed with human PDC-E2163–176 and again measured cytokine production. There were again four different patterns of cytokine production. TCC-1 and TCC-2 produced both IL-10 and IFN-γ in response to human PDC-E2 regardless of whether they were prestimulated with human PDC-E2 or E. coli OGDC-E2 presented by L-DR53 (Fig. 3⇓, group A). TCC-3, -4, and -5 that were preincubated with L-DR53 pulsed with human PDC-E2 secreted both IL-10 and IFN-γ after restimulation with human PDC-E2 (Fig. 3⇓, group B). In contrast, when preincubated with E. coli OGDC-E2, all three TCC produced only IL-10 after restimulation. Preincubation of TCC-6 with either of the peptides using L-DR53 as APC resulted in production of only IL-10 after restimulation with human PDC-E2 presented by allogeneic PBMC (Fig. 3⇓, group C). Finally, TCC-7 and -8 synthesized only IL-10 after preincubation with human PDC-E2, but both IL-10 and IFN-γ after preincubation with E. coli OGDC-E2 (Fig. 3⇓, group D). Cytokine production of TCC stimulated with PDC-E2 presented by irradiated HLA-DR53-matched allogeneic PBMC with or without preincubation in the presence of L-DR53 pulsed with human PDC-E2 or E. coli OGDC-E2 peptide. All TCC produce IFN-γ and IL-10 in response to stimulation with PDC-E2 and PBMC. When anergy is induced in costimulation-dependent TCC by preincubation with peptide-pulsed L-DR53, restimulated TCC produce IL-10 but not IFN-γ. The failure of costimulation-independent TCC to become anergic is accompanied by continued secretion of IFN-γ and IL-10 after restimulation. These data indicate that all eight TCC produce both IFN-γ and IL-10 in response to stimulation with human PDC-E2. The induction of anergy is associated with suppression of IFN-γ synthesis, while IL-10 production is not markedly affected. When anergy is not induced, TCC continue to produce IFN-γ and IL-10. We next examined the effect of preincubation with L-DR53 pulsed with human PDC-E2163–176 or E. coli OGDC-E234–47 on the ability of the eight TCC to regulate the proliferative response of their corresponding TCC in the presence of human PDC-E2163–176 peptide presented by PBMC. The proliferative response of TCC-1 and TCC-2 to PDC-E2 was not affected by coculture with corresponding TCC that had been preincubated with L-DR53 pulsed with human PDC-E2163–176 or E. coli OGDC-E234–47 (see Fig. 4⇓A for results of TCC-1, representative of group A). Preincubation of TCC-3, -4, and -5 with human PDC-E2/L-DR53 also had no effect on the proliferation of their corresponding TCC in the presence of PBMC pulsed with human PDC-E2 peptide. However, when preincubated with L-DR53 pulsed with E. coli OGDC-E2, all three TCC completely inhibited the proliferation of their corresponding unstimulated TCC (see Fig. 4⇓B for results of TCC-3, representative of group B). In the case of TCC-6, preincubation with L-DR53 pulsed with either human PDC-E2163–176 or E. coli OGDC-E234–47 abolished the proliferative response of its corresponding TCC in the presence of human PDC-E2-pulsed PBMC (Fig. 4⇓C). Finally, preincubation of TCC-7 and TCC-8 with human PDC-E2/L-DR53, but not with E. coli OGDC-E2/L-DR53, prevented proliferation of their corresponding TCC in the presence of human PDC-E2-pulsed PBMC (see Fig. 4⇓D for results of TCC-7, representative of group D). These data suggest that TCC with costimulation-independent responses to a specific Ag do not have a regulatory role after contact with the corresponding Ag in a costimulation-deficient manner. In contrast, TCC with costimulation-dependent responses to a specific Ag acquire regulatory characteristics when presented with this Ag in a costimulation-deficient manner. TCC that do not respond to a specific Ag have no effect on regulation after contact with the corresponding Ag in a costimulation-deficient manner. Regulatory function of anergic T cells. Once anergy is induced by preincubation with peptide-pulsed L-DR53, anergic TCC regulate the proliferation of their corresponding nonanergic TCC. A, TCC-1, which does not become anergic when preincubated with PDCpep- or OGDCpep-pulsed L-DR53 (see Fig. 2⇑), does not have regulatory function. B, TCC-3 preincubated with PDCpep-pulsed L-DR53 does not have regulatory function while this TCC preincubated with OGDCpep-pulsed L-DR53 exhibits regulatory activity. C, TCC-6 preincubated with PDCpep- or OGDCpep-pulsed L-DR53 has regulatory function. D, TCC-7 exhibits regulatory activity after preincubation with PDCpep-pulsed L-DR53, but not OGDCpep-pulsed L-DR53. Given the importance of the E residue at position 168 of PDC-E2 as the first TCR recognition site (25), we then evaluated the proliferation of TCC-1 in response to a panel of human PDC-E2163–176 peptides containing single amino acid substitutions at this position. As shown in Fig. 5⇓, TCC-1 proliferated after stimulation with all substituted human PDC-E2163–176 peptides presented by HLA-DR53-matched allogeneic PBMC. When L-DR53 was used as an APC, however, TCC-1 did not show a proliferative response to 168D, 168K, 168R, 168W, and 168G. These results indicate that TCC-1 is costimulation dependent for peptides 168D, 168K, 168R, 168W, and 168G. Proliferation assay of TCC-1 to analog peptides substituted at position 168E of human PDC-E2163–176 using L-DR53 or PBMC as APC. TCC-1 proliferated in response to all substituted peptides when PBMC were used as APC. This clone also proliferated to most of these peptides when presented by L-DR53, but not when amino acids with a negative or positive charge, aromatic amino acids, or G were substituted at position 168E of human PDC-E2163–176. WT, Wild type. Since altered peptide ligands with single residue substitutions in the antigenic peptide can induce agonism, antagonism, or antagonism with partial activation (26), it was of particular interest to further characterize the response of TCC-1 to some of the costimulation-dependent peptide analogs. TCC-1 preincubated with 168K- or 168W-pulsed L-DR53 did not proliferate when cocultured with PDC-E2-pulsed allogeneic PBMC (Fig. 6⇓A). We next prestimulated TCC-1 with 168K- or 168W-pulsed L-DR53 and then restimulated this TCC with PBMC that had or had not been pulsed with human PDC-E2163–176. TCC-1 prestimulated with 168K- or 168W-pulsed L-DR53 produced IL-10 but not IFN-γ in the presence of PDC-E2-pulsed PBMC (Fig. 6⇓B). They also regulated the proliferation of their corresponding TCC in the presence of PDC-E2 peptide-pulsed PBMC (Fig. 6⇓C). These findings are of particular interest since TCC-1 is one of the clones that could not be rendered anergic by preincubation with PDC-E2/L-DR53. Proliferation and cytokine production in response to PDC-E2 of TCC-1 preincubated with L-DR53 pulsed with 168K or 168W and regulatory function of anergic TCC-1. A, TCC-1, which responds to 168K or 168W in a costimulation-dependent manner, becomes anergic when preincubated with L-DR53 pulsed with 168K or 168W. 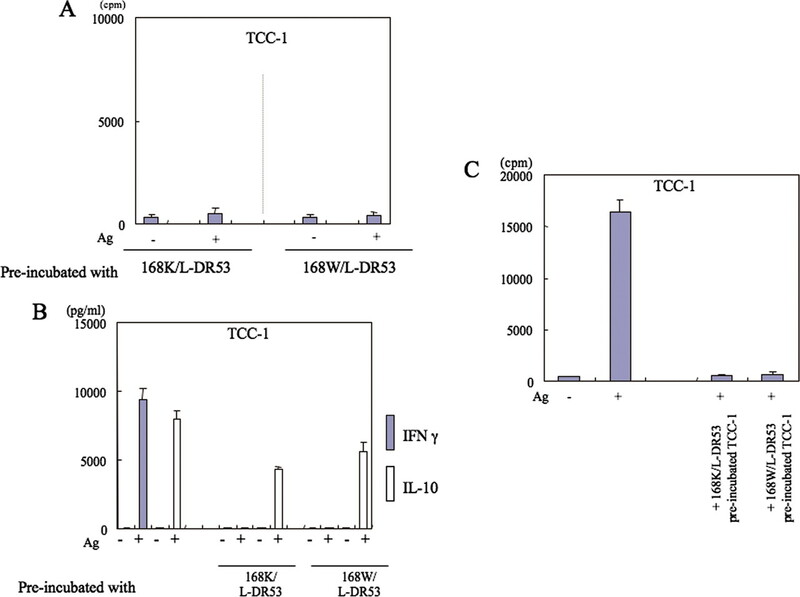 B, TCC-1 initially produces IFN-γ and IL-10, but only IL-10 once anergy is induced. C, TCC-1 regulates the proliferation of the corresponding TCC. Please note that in Fig. 2⇑, TCC-1 could not be rendered anergic by preincubation with PDC-E2/L-DR53. We next focused on whether anergy is induced when only a specific HLA molecule is expressed on the APC and presents the peptide of interest. We also examined whether anergy is maintained when the costimulation molecules CD80 or CD86 are present in such a system. For this purpose, we used L-DR53 transfected with CD80 or CD86 as APC. Note that our flow cytometric results confirmed that PBMC expressed HLA-DR, CD80, and CD86; L-DR53 expressed only HLA-DR53; CD80-L-DR53 expressed HLA-DR53 and CD80 but not CD86; and CD86-L-DR53 expressed HLA-DR53 and CD86 but not CD80 (data not shown). Our previous experiments indicated that, under normal circumstances, anergy to human PDC-E2 or E. coli OGDC-E2 or both could only be induced in TCC with a costimulation-dependent response to the respective Ag, i.e., TCC-3–8. We continued this analysis by first determining the proliferative response of these TCC to their relevant Ags using CD80-L-DR53 or CD86-L-DR53 as APC. As in our previous experiments (Fig. 1⇑), TCC-3, -4, and -5 did not proliferate in the presence of L-DR53 pulsed with E. coli OGDC-E2, but did proliferate when pulsed PBMC were used as APC. These clones also showed a proliferative response to E. coli OGDC-E2 when presented by CD80-L-DR53 or CD86-L-DR53, but this response was clearly reduced compared with that obtained with PBMC (Fig. 7⇓A for representative results). In the case of TCC-6, which did not proliferate in response to L-DR53 pulsed with human PDC-E2 or E. coli OGDC-E2 but did respond to PBMC pulsed with these Ags, there was also a reduced proliferation when CD80-L-DR53 or CD86-L-DR53 were used as APC compared with PBMC (Fig. 7⇓B). In the case of TCC-7 and TCC-8, which did not proliferate in the presence of PDC-E2-pulsed L-DR53 but did proliferate with Ag-pulsed PBMC, the proliferation was again reduced for CD80-L-DR53 or CD86-L-DR53 as APC compared with PBMC (Fig. 7⇓C). Thus, TCC with a costimulation-dependent response to a specific Ag proliferate in the presence of the costimulation molecules CD80 or CD86, although to a lesser extent than seen in the presence of a complete costimulation system as provided by PBMC. Proliferative response of TCC to human PDC-E2163–176 or E. coli OGDC-E234–47 using L-DR53, PBMC, CD80-L-DR53, or CD86-L-DR53 as APC. A, TCC-3 is costimulation dependent in its recognition of E. coli OGDC-E2 peptide, B, TCC-6 shows costimulation-dependent responses to both human PDC-E2 and E. coli OGDC-E2 peptide. C, The response of TCC-7 to human PDC-E2 peptide is costimulation dependent. CD80 or CD86 stimulation partially supports these proliferative responses in all cases. Next, we determined whether preincubation with Ag-pulsed CD80- or CD86-transfected L-DR53, like untransfected L-DR53, could induce anergy in costimulation-dependent TCC. TCC-3, -4, and -5 were preincubated with CD80-L-DR53 or CD86-L-DR53 pulsed with E. coli OGDC-E2, followed by a proliferation assay with human PDC-E2-pulsed PBMC. In this case, anergy was not induced (representative results are shown in Fig. 8⇓A). Similarly, when using the same Ag presentation system for stimulating TCC-6 with human PDC-E2 or E. coli OGDC-E2, no induction of anergy occurred (Fig. 8⇓B). Finally, preincubation with CD80-L-DR53 or CD86-L-DR53 pulsed with human PDC-E2 failed to induce anergy to human PDC-E2 in TCC-7 and TCC-8 (Fig. 8⇓C). These results indicate that peripheral regulation is easily broken with the costimulation molecules CD80 and CD86. Anergy induction of T cells preincubated with Ag-pulsed CD80-L-DR53 or CD86-L-DR53. Preincubation with Ag-pulsed CD80-L-DR53 or CD86-L-DR53 does not induce T cells anergy. 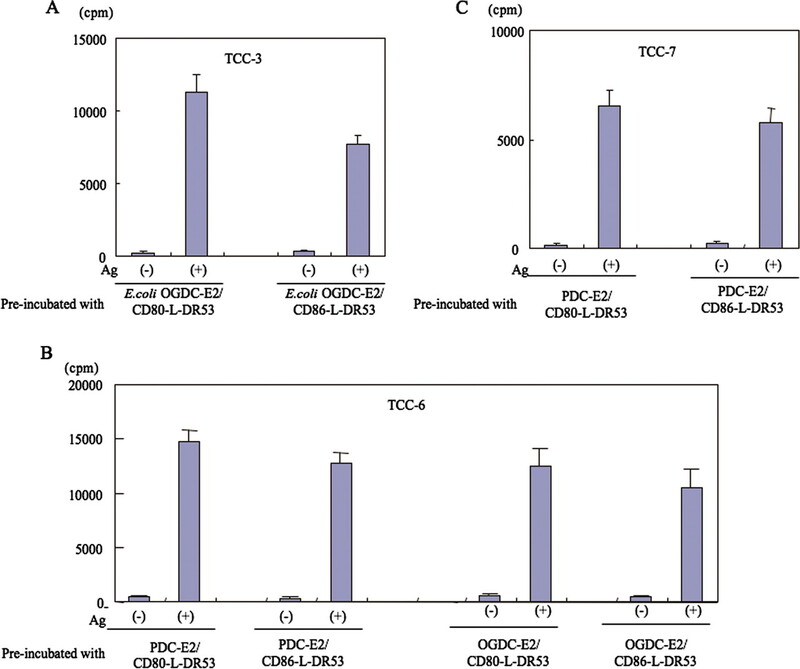 TCC-3 (A), TCC-6 (B), and TCC-7 (C) continue to proliferate in response to peptide-pulsed PBMC after preincubation with CD80-L-DR53 or CD86-L-DR53 pulsed with the peptides that were previously shown to induce anergy when presented by L-DR53. This indicates that the presence of one of the costimulatory molecules is sufficient to prevent anergy induction. Previously we demonstrated that some PBC patients have autoreactive effector T cells that are completely independent of costimulation (27). In the current study, we evaluated these TCC in greater detail by using both the important autoantigen PDC-E2163–176 and the putative mimic E. coli OGDC-E234–47 (12, 13) and by using not only PBMC and L-DR53 as APC, but also CD80-L-DR53 and CD86-L-DR53. Based on their ability to recognize one or both of these peptides when presented by costimulation-deficient L-DR53 or costimulation-competent PBMC, the autoreactive TCC analyzed in the present study could be classified into four groups. The first group (group A) is costimulation independent in its recognition of both human PDC-E2163–176 and E. coli OGDC-E234–47. Group B shows a costimulation-independent response to human PDC-E2163–176, but requires costimulation for recognition of E. coli OGDC-E234–47. Group C depends on costimulation for recognition of both human PDC-E2163–176 and E. coli OGDC-E234–47. Group D requires costimulation to respond to human PDC-E2163–176 and does not recognize E. coli OGDC-E2. Costimulation-dependent, but not costimulation-independent clones could be readily induced to become anergic. Herein, we demonstrate that TCC belonging to Group B can be induced to become anergic with the mimic E. coli OGDC-E234–47, even though they are costimulation independent in their recognition of human PDC-E2163–176. Generally, molecular mimicry is considered as a potential initiator of autoimmune responses. However, our results suggest that, in the case of costimulation-deficient Ag presentation systems, molecular mimicry also has the possibility to maintain peripheral tolerance (Fig. 2⇑, group B). Furthermore, TCC that could be induced to become anergic produced IL-10 (Fig. 3⇑, group B) and exhibited regulatory functions (Fig. 4⇑B). Altered peptide ligands with single residue substitutions in the antigenic peptide can induce agonism, antagonism, and antagonism with partial activation (26). The frequencies of analog peptides exhibiting these three different effects on TCC differ depending on the residue of the peptide substituted (28). Furthermore, peptide ligands with substitutions at TCR contact residues, by acting as specific TCR antagonists or partial agonists, can play a role in down-modulating autoreactive T cell responses (29, 30, 31, 32). Previously, we reported that position 168E of human PDC-E2163–176 is the first TCR recognition site (25). In the present work, we used peptide analogs of human PDC-E2163–176 with single amino acid substitutions at this position. 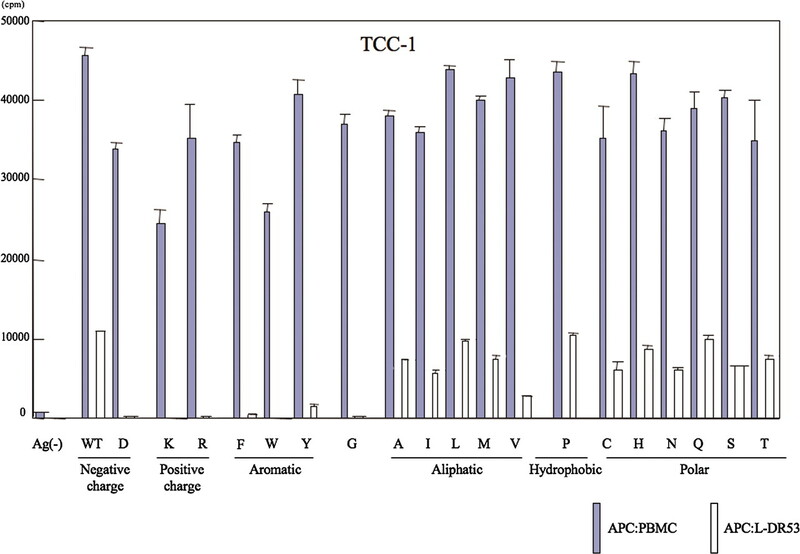 TCC-1 proliferated in response to all of the substituted peptide analogs when presented by professional APC (PBMC) (Fig. 5⇑). In contrast, TCC-1 did not respond to the substituted peptides 168D, 168K, 168R, or 168W when presented by costimulation-deficient L-DR53. Our results obtained with 168K and 168W (Fig. 6⇑) indicate that certain specific substituted peptide analogs of position 168E of human PDC-E2163–176 can induce anergy. The resulting anergized clones were found to produce IL-10, but not IFN-γ, and to function as regulators of the proliferative response of their corresponding nonanergized clones. It is now well established that T cells capable of suppressing the effector functions of other T cells play an important role in the control of immune responses, particularly to self-Ags. Several subsets of such suppressor cells have been identified, including thymus-derived regulatory T cells (Tregs) expressing CD4, CD25, and the transcription factor Foxp3, Th3 cells that produce high levels of TGFβ, and Tr1 cells that exert their regulatory function by secreting mostly IL-10. Of note, adaptive Tregs that are phenotypically and functionally indistinguishable from Foxp3+ Tregs can arise from the conversion of peripheral CD25− cells. Previous work from our laboratory showed that the anergic suppressor T cells generated by stimulation with PDC-E2163–176 in a costimulation-incompetent system did not exhibit some of the characteristics typical of Tregs, such as high expression of CD25 and contact-dependent suppressor activity (15). This suggests that the anergic suppressor TCC generated in our system belong to a different subset of regulatory cells. In our previous work, we also demonstrated that these TCC produced IFN-γ, IL-10, and low amounts of IL-4 in response to PDC-E2163–176 before the induction of anergy (15). Once anergic, they synthesized only IL-10, and their regulatory activity could be partially abrogated by blocking IL-10. Some of the TCC underwent an intermediate stage during which they no longer proliferated in response to PDC-E2163–176, but still secreted both IL-10 and IFN-γ. Since we did not analyze IL-4 production in partially and completely anergized TCC, we cannot determine whether the suppressor TCC exhibited a Th2 cytokine profile or had become Tr1 cells producing only IL-10. If T cells can easily be induced to become not only anergic but also regulatory as described above, peptide analog vaccine therapy would be expected to be successful in autoimmune diseases. Actually, even though this approach shows some promise in the induction of strong immune responses in some types of infection or cancer (33), it did not work well in autoimmune diseases. To clarify why anergy is not induced in vivo, we focused on the function of the costimulation molecules CD80 and CD86, which play a crucial role in the induction of autoimmune diseases (21). Note, however, that we used TCC obtained after several rounds of Ag stimulation, i.e., activated memory T cells, whereas the breaking of tolerance that eventually results in the development of autoimmune disease involves naive T cells. In our experimental systems, proliferation of some autoreactive TCC in response to PDC-E2 or OGDC-E2 was supported by professional APC (PBMC), but not by costimulation-deficient APC (L-DR53), indicating that CD80 or CD86 are central to this process. This is further supported by the finding that the proliferative response was diminished, but complete anergy was not achieved when these peptides were presented by L-DR53 transfected with CD80 or CD86 (Fig. 7⇑). This suggests that peripheral tolerance cannot be maintained in the presence of costimulation (Fig. 8⇑). Note that the major autoantigen in PBC, PDC-E2, is a ubiquitous protein, yet, the specific target of the autoimmune response in PBC are biliary epithelial cells. It has been hypothesized that biliary epithelial cells act as APC, based on the observation that these cells express MHC class II. However, since they lack costimulation molecules, they would be expected to silence rather than activate autoreactive T cells. Indeed, we found that biliary epithelial cells can induce T cell anergy (15, 34). Therefore, we submit that biliary epithelial cells themselves may be a candidate for induction of peripheral tolerance. However, if costimulation molecules such as CD80 or CD86 exist around biliary epithelial cells, as has been suggested in several studies (35, 36, 37), peripheral tolerance may be broken. This is important as biliary cells are surrounded by dendritic cells, macrophages (38), and activated B cells (39). These data are of great interest since, if autoreactive T cells can be induced to become anergic, this would represent a strong tool to control autoimmune diseases such as PBC. However, as costimulation molecules are expressed in the inflammatory area where regulatory function must work, T cell anergy may not be induced. In that case, a better therapeutic approach would be to transfer anergic T cells (adoptive cellular immunotherapy) for control of the autoimmune process. We appreciate the outstanding work of Dr. Andrea T. Borchers. ↵1 This study was partly supported by Grant-in-Aid 17590657 for Scientific Research (C) of Japan and National Institutes of Health Grant DK39588. ↵3 Abbreviations used in this paper: PBC, primary biliary cirrhosis; Treg, regulatory T cell; PDCpep, human PDC-E2163–176 peptide; OGDCpep, E. coli OGDC-E234–37 peptide. Kaplan, M. M., M. E. Gershwin. 2005. Primary biliary cirrhosis. N. Engl. J. Med. 353: 1261-1273. Kita, H., Z. X. Lian, J. Van de Water, X. S. He, S. Matsumura, M. Kaplan, V. Luketic, R. L. Coppel, A. A. Ansari, M. E. Gershwin. 2002. Identification of HLA-A2-restricted CD8+ cytotoxic T cell responses in primary biliary cirrhosis: T cell activation is augmented by immune complexes cross-presented by dendritic cells. J. Exp. Med. 195: 113-123. Kita, H., S. Matsumura, X. S. He, A. A. Ansari, Z. X. Lian, J. Van de Water, R. L. Coppel, M. M. Kaplan, M. E. Gershwin. 2002. Quantitative and functional analysis of PDC-E2-specific autoreactive cytotoxic T lymphocytes in primary biliary cirrhosis. J. Clin. Invest. 109: 1231-1240. Shimoda, S., M. Nakamura, H. Ishibashi, K. Hayashida, Y. Niho. 1995. HLA DRB4 0101-restricted immunodominant T cell autoepitope of pyruvate dehydrogenase complex in primary biliary cirrhosis: evidence of molecular mimicry in human autoimmune diseases. J. Exp. Med. 181: 1835-1845. Shimoda, S., J. Van de Water, A. Ansari, M. Nakamura, H. Ishibashi, R. L. Coppel, J. Lake, E. B. Keeffe, T. E. Roche, M. E. Gershwin. 1998. Identification and precursor frequency analysis of a common T cell epitope motif in mitochondrial autoantigens in primary biliary cirrhosis. J. Clin. Invest. 102: 1831-1840. Selmi, C., M. E. Gershwin. 2004. Bacteria and human autoimmunity: the case of primary biliary cirrhosis. Curr. Opin. Rheumatol. 16: 406-410. Aoki, C. A., C. M. Roifman, Z. X. Lian, C. L. Bowlus, G. L. Norman, Y. Shoenfeld, I. R. Mackay, M. E. Gershwin. 2006. IL-2 receptor α deficiency and features of primary biliary cirrhosis. J. Autoimmun. 27: 50-53. Rieger, R., P. S. Leung, M. R. Jeddeloh, M. J. Kurth, M. H. Nantz, K. S. Lam, D. Barsky, A. A. Ansari, R. L. Coppel, I. R. Mackay, M. E. Gershwin. 2006. Identification of 2-nonynoic acid, a cosmetic component, as a potential trigger of primary biliary cirrhosis. J. Autoimmun. 27: 7-16. Amano, K., P. S. Leung, R. Rieger, C. Quan, X. Wang, J. Marik, Y. F. Suen, M. J. Kurth, M. H. Nantz, A. A. Ansari, et al 2005. Chemical xenobiotics and mitochondrial autoantigens in primary biliary cirrhosis: identification of antibodies against a common environmental, cosmetic, and food additive, 2-octynoic acid. J. Immunol. 174: 5874-5883. Amano, K., P. S. Leung, Q. Xu, J. Marik, C. Quan, M. J. Kurth, M. H. Nantz, A. A. Ansari, K. S. Lam, M. Zeniya, R. L. Coppel, M. E. Gershwin. 2004. Xenobiotic-induced loss of tolerance in rabbits to the mitochondrial autoantigen of primary biliary cirrhosis is reversible. J. Immunol. 172: 6444-6452. Long, S. A., C. Quan, J. Van de Water, M. H. Nantz, M. J. Kurth, D. Barsky, M. E. Colvin, K. S. Lam, R. L. Coppel, A. Ansari, M. E. Gershwin. 2001. Immunoreactivity of organic mimeotopes of the E2 component of pyruvate dehydrogenase: connecting xenobiotics with primary biliary cirrhosis. J. Immunol. 167: 2956-2963. Tanimoto, H., S. Shimoda, M. Nakamura, H. Ishibashi, A. Kawano, T. Kamihira, S. Matsushita, M. E. Gershwin, M. Harada. 2003. Promiscuous T cells selected by Escherichia coli: OGDC-E2 in primary biliary cirrhosis. J. Autoimmun. 20: 255-263. Shimoda, S., M. Nakamura, H. Shigematsu, H. Tanimoto, T. Gushima, M. E. Gershwin, H. Ishibashi. 2000. Mimicry peptides of human PDC-E2163–176 peptide, the immunodominant T-cell epitope of primary biliary cirrhosis. Hepatology 31: 1212-1216. Gimmi, C. D., G. J. Freeman, J. G. Gribben, G. Gray, L. M. Nadler. 1993. Human T-cell clonal anergy is induced by antigen presentation in the absence of B7 costimulation. Proc. Natl. Acad. Sci. USA 90: 6586-6590. Shimoda, S., F. Ishikawa, T. Kamihira, A. Komori, H. Niiro, E. Baba, K. Harada, K. Isse, Y. Nakanuma, H. Ishibashi, M. E. Gershwin, M. Harada. 2006. Autoreactive T-cell responses in primary biliary cirrhosis are proinflammatory whereas those of controls are regulatory. Gastroenterology 131: 606-618. Ausubel, L. J., J. I. Krieger, D. A. Hafler. 1997. Changes in cytokine secretion induced by altered peptide ligands of myelin basic protein peptide 85–99. J. Immunol. 159: 2502-2512. Kumar, V., V. Bhardwaj, L. Soares, J. Alexander, A. Sette, E. Sercarz. 1995. Major histocompatibility complex binding affinity of an antigenic determinant is crucial for the differential secretion of interleukin 4/5 or interferon γ by T cells. Proc. Natl. Acad. Sci. USA 92: 9510-9514. Nicholson, L. B., J. M. Greer, R. A. Sobel, M. B. Lees, V. K. Kuchroo. 1995. An altered peptide ligand mediates immune deviation and prevents autoimmune encephalomyelitis. Immunity 3: 397-405. Pfeiffer, C., J. Stein, S. Southwood, H. Ketelaar, A. Sette, K. Bottomly. 1995. Altered peptide ligands can control CD4 T lymphocyte differentiation in vivo. J. Exp. Med. 181: 1569-1574. Murtaza, A., V. K. Kuchroo, G. J. Freeman. 1999. Changes in the strength of co-stimulation through the B7/CD28 pathway alter functional T cell responses to altered peptide ligands. Int. Immunol. 11: 407-416. Poussin, M. A., E. Tuzun, E. Goluszko, B. G. Scott, H. Yang, J. U. Franco, P. Christadoss. 2003. B7-1 costimulatory molecule is critical for the development of experimental autoimmune myasthenia gravis. J. Immunol. 170: 4389-4396. Gao, J. X., H. Zhang, X. F. Bai, J. Wen, X. Zheng, J. Liu, P. Zheng, Y. Liu. 2002. Perinatal blockade of B7-1 and B7-2 inhibits clonal deletion of highly pathogenic autoreactive T cells. J. Exp. Med. 195: 959-971. Reynolds, J., F. W. Tam, A. Chandraker, J. Smith, A. M. Karkar, J. Cross, R. Peach, M. H. Sayegh, C. D. Pusey. 2000. CD28–B7 blockade prevents the development of experimental autoimmune glomerulonephritis. J. Clin. Invest. 105: 643-651. Shigematsu, H., S. Shimoda, M. Nakamura, S. Matsushita, Y. Nishimura, N. Sakamoto, Y. Ichiki, Y. Niho, M. E. Gershwin, H. Ishibashi. 2000. Fine specificity of T cells reactive to human PDC-E2163–176 peptide, the immunodominant autoantigen in primary biliary cirrhosis: implications for molecular mimicry and cross-recognition among mitochondrial autoantigens. Hepatology 32: 901-909. Madrenas, J., R. H. Schwartz, R. N. Germain. 1996. Interleukin 2 production, not the pattern of early T-cell antigen receptor-dependent tyrosine phosphorylation, controls anergy induction by both agonists and partial agonists. Proc. Natl. Acad. Sci. USA 93: 9736-9741. Kamihira, T., S. Shimoda, K. Harada, A. Kawano, M. Handa, E. Baba, K. Tsuneyama, M. Nakamura, H. Ishibashi, Y. Nakanuma, M. E. Gershwin, M. Harada. 2003. Distinct costimulation dependent and independent autoreactive T-cell clones in primary biliary cirrhosis. Gastroenterology 125: 1379-1387. Chen, Y. Z., S. Matsushita, Y. Nishimura. 1996. Response of a human T cell clone to a large panel of altered peptide ligands carrying single residue substitutions in an antigenic peptide: characterization and frequencies of TCR agonism and TCR antagonism with or without partial activation. J. Immunol. 157: 3783-3790. Allen, P. M.. 1994. Peptides in positive and negative selection: a delicate balance. Cell 76: 593-596. Jameson, S. C., M. J. Bevan. 1995. T cell receptor antagonists and partial agonists. Immunity 2: 1-11. Sette, A., J. Alexander, J. Ruppert, K. Snoke, A. Franco, G. Ishioka, H. M. Grey. 1994. Antigen analogs/MHC complexes as specific T cell receptor antagonists. Annu. Rev. Immunol. 12: 413-431. Carrabba, M. G., C. Castelli, M. J. Maeurer, P. Squarcina, A. Cova, L. Pilla, N. Renkvist, G. Parmiani, L. Rivoltini. 2003. Suboptimal activation of CD8+ T cells by melanoma-derived altered peptide ligands: role of Melan-A/MART-1 optimized analogues. Cancer Res. 63: 1560-1567. Kamihira, T., S. Shimoda, M. Nakamura, T. Yokoyama, Y. Takii, A. Kawano, M. Handa, H. Ishibashi, M. E. Gershwin, M. Harada. 2005. Biliary epithelial cells regulate autoreactive T cells: implications for biliary-specific diseases. Hepatology 41: 151-159. Kaji, K., K. Tsuneyama, Y. Nakanuma, K. Harada, M. Sasaki, S. Kaneko, K. Kobayashi. 1997. B7-2 positive cells around interlobular bile ducts in primary biliary cirrhosis and chronic hepatitis C. J. Gastroenterol. Hepatol. 12: 507-512. Spengler, U., L. Leifeld, I. Braunschweiger, F. L. Dumoulin, M. Lechmann, T. Sauerbruch. 1997. Anomalous expression of costimulatory molecules B7-1, B7-2 and CD28 in primary biliary cirrhosis. J. Hepatol. 26: 31-36. Tsuneyama, K., K. Harada, M. Yasoshima, K. Kaji, M. E. Gershwin, Y. Nakanuma. 1998. Expression of co-stimulatory factor B7-2 on the intrahepatic bile ducts in primary biliary cirrhosis and primary sclerosing cholangitis: an immunohistochemical study. J. Pathol. 186: 126-130. Iwata, M., K. Harada, K. Hiramatsu, K. Tsuneyama, S. Kaneko, K. Kobayashi, Y. Nakanuma. 2000. Fas ligand expressing mononuclear cells around intrahepatic bile ducts co-express CD68 in primary biliary cirrhosis. Liver 20: 129-135. Bjorkland, A., L. Loof, I. Mendel-Hartvig, T. H. Totterman. 1994. Primary biliary cirrhosis. High proportions of B cells in blood and liver tissue produce anti-mitochondrial antibodies of several Ig classes. J. Immunol. 153: 2750-2757. Azuma, M., M. Cayabyab, D. Buck, J. H. Phillips, L. L. Lanier. 1992. CD28 interaction with B7 costimulates primary allogeneic proliferative responses and cytotoxicity mediated by small, resting T lymphocytes. J. Exp. Med. 175: 353-360.